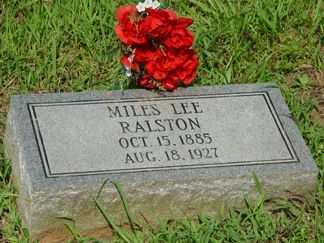 Miles Lee Ralston, husband of Ida Woods. We all regret to learn of the death of Mr. Miles Ralston, who was burned to death in South Georgia last week, and was brought here for burial. The tragic death of Mr. Miles Ralston, of Moultrie, Georgia, came as a severe shock to the many friends and relatives living in this community. Mr. Ralston was burn to death. He ran out of gasoline and went to a nearby farm house and bought enough gasoline to get him to the next filling station. It being dark, he borrowed a kerosene lamp so he could see how to pour the gas into the tank. The flame from the lamp ignited the gas and flames completely covered Mr. Ralston; the flames burning him so severely that he lived only four hours after the sad occurrence. Mr. Ralston lived in the Center community for a number of years and married Miss Ida Woods, of that place, a sister of Mr. Ben Woods. He had been living in South Georgia for eighteen or more years. The remains were interred in Macedonia Cemetery last Saturday. He is survived by his wife and six children, the youngest being ten years old.